The broad market may be spinning its wheels, content to go nowhere for the past week and a half. If you look under the hood, though, you'll find most stocks actually haven't been that docile. They're either outperforming or underperforming the indices. That's useful information too. Not that trends are incapable of reversing course, but a trend in motion is likely to stay in motion until something decidedly stands in its way. That's why the budding sector trends we've seen take shape over the course of the past few days are so interesting. They likely point to the shape of things to come. And, the simplest way of identifying these trends is with a simple visual comparison. That's what the graphic below does. It compares how each major sector group has performed over the course of the past twelve months. 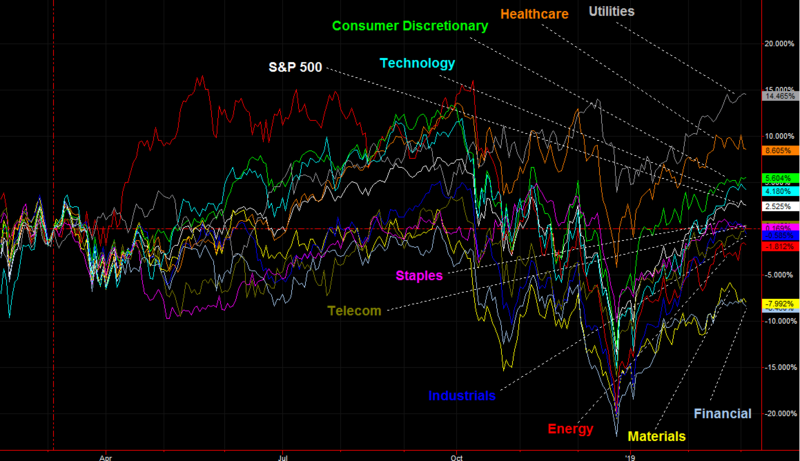 As is made clear from the onset, utilities stocks are the 12-month leader, up 14.5% since this time last year. That uptrend doesn't appear to be slowing down either. At the other end of the spectrum, you'll find financials, which have struggled to come out of the broad market's December slump. Both are noteworthy trends, but not the only trends worth noting. The most noteworthy action can be found in the congestion in the middle of the two extremes. It's there in the middle of the mess you'll find that the industrial stocks (blue) have rolled over more than any other group. Also in the middle, you can see telecom stocks (brown) are making slow and steady progress, and even the usually-volatile energy stocks (red) are still chugging along. The most suspect names right now include healthcare (orange) and materials (yellow), both of which have lost more than a little ground in just the past few days. While the individual performances from each group are telling in regards to teach group, there's a bigger-picture clue buried in here as well. That is, we're generally seeing a flow towards more defensive arenas and movement away from more aggressive areas. That's not an absolute, as there are no absolutes when it comes to the market. But, by market standards, it's a strong hint that investors are at least tacitly thinking defensively. If they're thinking it, they're more prone to acting accordingly.